*I will officially retire comedy after that horrid, forced joke that you had to read. I have contemplated my life and realized that was the pinnacle of lame jokes I have ever written and now I shall sit in the corner of my room, in the fetal position, and really think about what I have done to you awesome readers. It’s no shock that I worship Judd Apatow, as he is one of the directors that inspired me to pursue comedy after I saw 40-Year-Old Virgin, so I might sound biased; but hear me out. I think he is one of those rare comedy directors that can walk that thin line of creating romance movies that have some romantic movie clichés but also go against some of the clichés. He basically creates a fantasy, while grounding it with real characters and life situations so we, as an audience, can relate to it more. This one does that and then some. This has to have the most heart I have seen in an Apatow film. There were moments that really displayed great human emotion that made sense for the characters, but then can turn it around with comedic relief. He creates life on screen and he nails it this one. I did find some of the characters a bit underused; however, they were too vital to the overall story so I will let it slide. 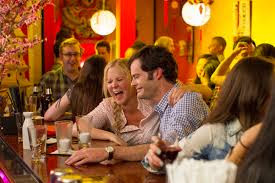 Amy Schumer, who also doubles up as writer, does a great job developing her character into something you don’t see now-a-days in comedies. She was broken and, when the scene was right, she would display it very well. She is also extremely funny as she flips the stereotype of a male lead for this type of film and she brings the humor, heart and layers to her character to show that a woman can do this role just as well. Her relationship with Bill Hader was genuine and I totally bought into it. Lebron James is great and surprisingly funny delivering dead-pan humor with such ease as if he has been doing comedy for years. The cameos are also a staple of an Apatow film and they don’t disappoint. Some of the actors, such as Brie Larson, were a bit underplayed and it’s a crime that there wasn’t more screen time for Colin Quinn. He plays Amy’s father and he plays a pivotal role for Amy’s character and why she is the way she is and he was great in it. It’s clean? It’s hard to judge Apatow on his cinematography because all of them have a sterile look. Not a bad thing, just noticeable. I think Funny People was the only one to kind of darken the shots up and not have it look like a Sear’s ad. The birds-eye shots of the city were nice. Apatow haters rejoice! This one isn’t over two hours long and you will hate it less than you usually do. It’s a good rhythm that will keep the energy up with its humor and its perfect time with two hours, no more, no less. This is one of his shortest, right in front of 40-Year-Old Virgin as the second shortest, as everything else he directs is at least two hours and twenty minutes long. For me: None. For everyone else: they will probably still complain about the time length as Apatow is notorious for long movies. Overall: Funny, endearing, great characters and a great, fun time at the theaters. Amy Schumer, please continue to write and expand your acting career because you have talent. If you aren’t a fan of hers, please give this a shot because it might just change your mind.